Did you miss us? It’s been a few weeks since we posted our usual mix of expert advice, industry know-how and dry wit, so I expect so. Rest assured though that in that time we haven’t just been speculating on Season 2 of Stranger Things. No, we’ve also been busy putting some final touches on a series of improvements to your Client Admin area, designed to give you more autonomy over your events, and provide all the tools you need to help sell more tickets. Here’s a quick guide to what’s changed, and how to make the most of it. We’ve introduced improved reporting functionality to your Client Admin area, providing you with in depth analysis and cross-event sales reporting. 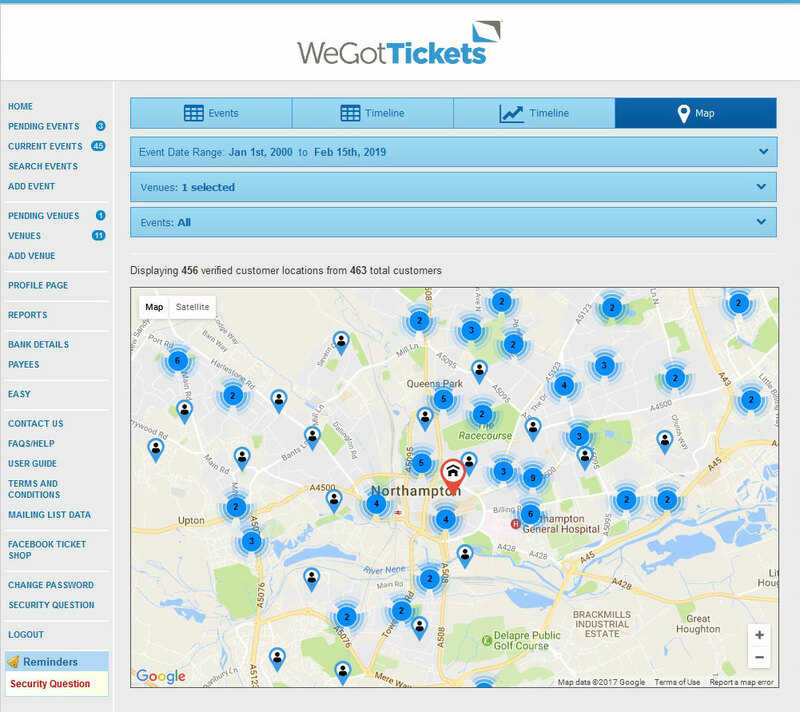 Just click on (you guessed it) ‘Reports’ in the left-hand menu and then ‘Events’ in the top menu to see an overview of your ticket sales, ‘Timeline’ (select either table or graph as indicated by the icons) to see how far in advance you are selling them, or ‘Map’ to see where your customers are based. 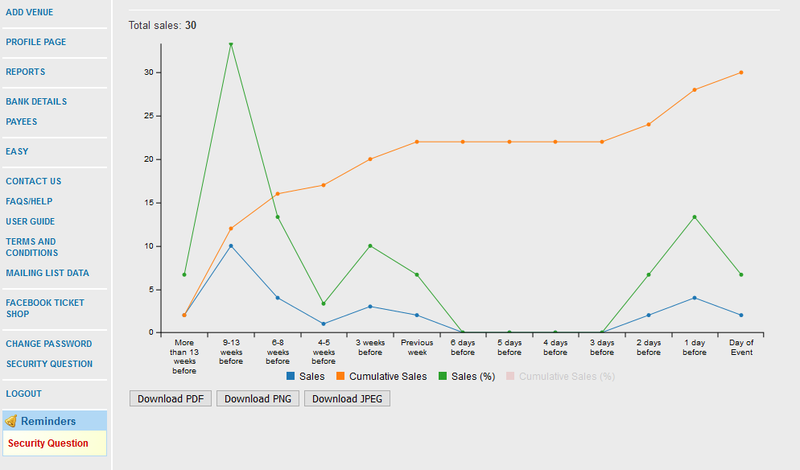 Find out the who, what, when and where, and then filter the information by date range, venue or event and view in a range of different charts and graphs. Who doesn’t like a good bar chart, right? There’s a lot of info to take in, but once you get to grips with it you can use it to inform and evaluate your marketing campaigns to maximise sales. If most of your tickets sell in the week of your event, then maybe you should focus on driving early interest. If the majority of your customers fall within the same postcode, then perhaps looks at ways to extend your reach and target those a bit further afield. You might even want to compare events to identify what type of artists are able to pull in a crowd from further afield and which price or tier systems work the best. You can also use the timeline features to see what impact your marketing activities have had, pinpointing the moment that paid social promotion or PPC advertising kicked off. When viewing your sales for any given event the information is now displayed in a table and fully searchable, sortable and downloadable. We’ve also added a lovely bar chart option to the ‘sales by week’ and ‘sales in date order’ drop-downs too for those of you who prefer a visual aid. We’re geeky like that. We’ve made a few changes to our event editing system too, meaning that you now have more autonomy. Any changes you make to events that have not yet sold tickets are now instantaneous, as are changes to the event description and support act fields regardless of ticket sales. I mean, our support team are fast, but waiting any time at all to have that pesky typo corrected in your event description is mad, right? In fact, the whole editing process has been streamlined, including accurate booking fee percentage and value display, an improved edit notification system, clearer formatting and a wider Client Admin display. We even fixed a few bugs along the way, which were just a tad embarrassing. In August last year we asked you what features you’d like to see introduced to make WeGotTickets even better, and ‘improved sales reporting’ came out on top. This may be just the first iteration (and just one of a few areas we’re working hard to improve) but if it’s used correctly, it could help make a big difference to your ticket sales. Ready to take a look for yourself? Log in to your Client Admin area here.